The Twilight Saga concludes with The Twilight Saga: Breaking Dawn - Part 2. Complete your collection with one of the final members of the Cullen vampire coven: Carlisle. 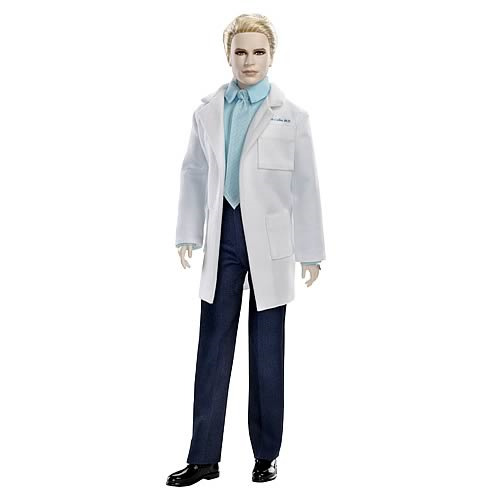 The Twilight Saga Breaking Dawn Part 2 Carlisle Cullen Barbie Doll makes his debut dressed in his confidence-inspiring doctor ensemble from the film. Fans of the movies, and particularly the Cullen clan's leader, will love adding this character to their collection! This doll measures approximately 11 1/2-inches tall. Ages 6 and up.